To celebrate Purim outside of Israel (or, as people here say – “in chul”), you have to wade through a whole lot of not-Purim to get there. Maybe you're lucky, and live in a Jewish neighbourhood, so you don't have so much wading to do. But either way, you've got some wading to do. I use that word deliberately. Wading isn't easy ; it's not swimming, it's not walking... It's kind of like the worst of both worlds. It's not something fish do. It's something we gawky humans do when we're out of our element. Purim outside of Israel can be a fun bubble, unlike, say, Yom Kippur in chul. If you see someone in costume - and I always made a point of wearing a costume - you wave, shout greetings… it's tons of fun. This year, I didn’t care so much whether I wore a costume, and I don’t think it’s a coincidence. Okay, partly it’s because I’m a bit blue, or blah, or whatever you want to call it. I’m away from everyone I love (except 4 important people I love!) and don’t always feel that festive. But also – here, you don’t need the costume to feel like it’s Purim. It just is. A Conservative rabbi once tried to convince our conversion class – and it took some doing – that there was no such thing, really, as “having a bar mitzvah.” All you have to do to is wake up on your thirteenth birthday (or the day after; I forget) and you are bar mitzvah. You can’t make it happen, and neither can you stop it. Sure, you can get all dressed up, have an aliyah (great! ), have a party if you like. But none of those things make you bar mitzvah… you either are or you aren’t. It’s either Purim or it isn’t. Here, it is. I feel like, all those years outside of Israel, every year we’d get dressed up and pretend it was Purim. Now that we’re here, we don’t have to pretend. No more wading – here, we’re in our element. It’s all around us… Purim is in the air. Even if you do nothing at all, it really is Purim. I felt the same way on Yom Kippur, when the thousands of Jews around here who aren’t shomer mitzvos (observant) brought their lives to a standstill. For 25 hours (give or take), they didn’t go to the beach, didn’t drive their cars, didn’t open their stores. Because whatever they personally happen to believe, it really WAS Yom Kippur. You can’t argue with it, it just is. So we did the mitzvos of the day, and celebrated with friends (KShmu BBQ! ), and it really was kind of great, despite my semi-funk. GZ really really really wanted to dress up as a pirate, so he dressed up as a pirate and had a wonderful time. Naomi Rivka had a couple of costume options, but really really really didn’t want to get dressed up, so she simply… didn’t. She wore the same clothes she wears to school every day. Ted/Akiva got dressed up, of course. There’s a Superman shirt underneath the suit, which is itself the “Clark Kent” part of the costume, so the whole thing really IS a costume… he didn’t actually WEAR a suit to bike to an Israeli BBQ on a hot sunny day! And I didn’t have strong feelings one way or another – and didn’t wear a costume… sort of. Akiva bought me a clown nose, and at first, I was just going to pin it (still in the packaging that says “clown nose”) in a half-hearted way to my regular clothing. But at the last minute, I pinned it in a half-hearted way and added a toy stethoscope, becoming, in the process, a medical clown. It turned out, I was not the only medical clown there. It’s a popular profession here in Israel, and one of the aforementioned teenaged girls dressed up as one as well. Her costume was better than mine - her father works at the med school at the Technion and she had a real lab coat, as well as a colourful clown wig (scroll up and you’ll see it in the picture of Naomi Rivka). Mine was a costume, but low-key; it wasn’t really a costume. And I was okay with that. Here’s the thing: my secret Purim shame. Growing up, we dressed up every year… for Hallowe’en. And it was great! We could dress as anything we wanted, the sky’s the limit. Trick or treating, UNICEF boxes, the works. I loved it. Then, a few months later, along would roll Purim. Which wasn’t a “real” holiday, because nobody outside of our family and Hebrew school had ever heard of it. It also wasn’t a real dress-up holiday because… my mother’s rule… you could ONLY dress up as someone from the Purim story. As a mom, I think I can understand her reasoning now: why not take advantage of this “duplicate” costume opportunity to strengthen and reinforce our Jewish education? Even better: why not take a real stand against the non-Jewish majority culture, emulating Esther, even, by being super-Jewish in your story-of-Purim costume? But there are only so many characters in the story, especially for a little kid who’s never actually read the whole megillah. Not so many characters, and I think I was all of them at one time or another: Haman, Esther, Mordechai, the king, Vashti. Lather, rinse, repeat. It wasn’t until I became religious, as an adult, that I realized this wasn’t an actual rule. I learned the rules, and not only were costumes not even IN the rules, but among frum families I met, I discovered that the kids could dress up as anything they wanted. Barring tznius concerns and what Elisheva likes to say in a thick chareidi accent, “tarbus hagoyim” (non-Jewish culture), the sky’s the limit. Not just because they don’t get to celebrate Hallowe’en (poor frum kids), but because they probably aren’t so concerned that their Jewish education will be watered down or threatened by a non-megillah-related costume. And I guess it’s the same thing here. My wearing a costume or not wearing a costume wouldn’t have changed anything about the nature of the day. I could wear one, if I wanted to, but there was no pressure. So I sort of did, and sort of didn’t. I can’t say what I’ll do next year. We’re living minute to minute here, so I really can’t even say what I’ll be doing next week, let alone twelve months from now. Will I wear a costume? Maybe, maybe not. But whether or not I join in, it will be Purim, in a way that I’ve honestly never experienced before. I suppose it helps also that if you do wear a costume, you can actually WEAR it, rather than toss a parka on over it so you can slip and slide across the ice to shul to huddle in the warmth as you hear the megillah. 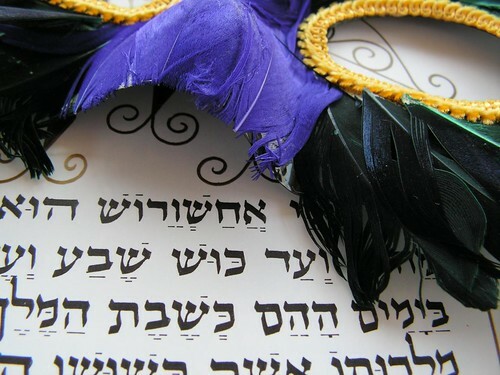 The one constant of Purim, wherever you may find yourself, is the theme of “venahafoch hu” – “and it was turned around.” The “fate” of the Jews turned from bad to good, while the “fate” of Haman went “from bat to verse,” as the terrible vampire poet joke goes. Whatever we may be wearing a year from now, I’m excited to see what next Purim in Israel will bring… and may there be many more to come. Hi, I am in school for graphic design and for my final project I am designing a website for olim. I want to have a section that will have different kinds of aliyah and Israel stories. I found your blog and was wondering if I would be able to use some of your stories. If you'd like to excerpt a bit with a link to my blog, that might be okay. Why don't you email me directly (jay3fer "at" gmail "dot" com) and let me know what you have in mind?